August 01, 2016 in New Delhi Lenovo announced their new K series device Lenovo Vibe K5 Note. It looks similar to Lenovo Vibe K5 Plus. 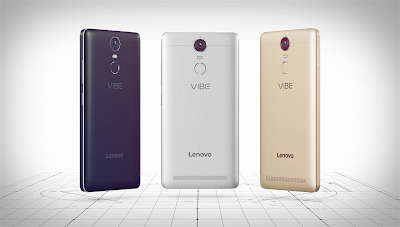 Lenovo launched Vibe K5 Note little late in India. from specs and pricing we it is very much similar to and stand out to be strong competitor of Redmi Not 3. Vibe K5 Note comes with full metallic body with Silver, Graphite Grey & Gold colors options. Lenovo Vibe K5 Note comes in two variants one is with 3GB RAM priced at 11,999/- INR and other with 4GB RAM priced at 13,499/- INR. This both model are exclusively available on Flipkart via open sales that is you can directly go for buying the phone. No flash sale this time good on part of Lenovo for making this move. Lenovo Vibe K5 Note featuring 5.5 inches Full HD display with a 178 degree wide viewing angle and 1080p resolution. The smartphone also comes with advanced sound input and recording capabilities. Lenovo’s configured 3-mic system and state-of-the-art Wolfson audio codec effectively filter out ambient noise and greatly enhance sound quality during recording. K5 Note also features Dolby Atmos. Combined with a 13MP PDAF rear camera and an 8MP wide angle. Lenovo Vibe K5 Note is dual SIM device with dial SIM standby technology with supporting 4G LTE on both SIM slots. It also have another connectivity options like 2G, 3G, Wi-Fi 802.11 a/b/g/n/ac, Wi-Fi hotspot, Bluetooth 4.0 along with GPS. Lenovo Vibe K5 Note running on Android 6.0 with TheaterMax Technology .It is also equipped with 64-bit 8-Core MediaTek Helio P10 MT6755 Octa-Core along with Mali-T860-MP2 GPU clocked at 1.8GHz and a high-capacity 3,500mAh embedded battery to last for a long time. It have 32 GB internal memory which can be expanded upto 128 GB. After this launch Lenovo Vibe K5 Note will face competition from Xiaomi Redmi Note 3, Le Eco 2, Asus Zenfone Max 2016. Let's see how Lenovo Vibe K5 Note performs against them. Do let us know your thoughts and opinions in comment below. Stay tuned for more updates and thank you for reading.